We first opened our doors on November 13, 1993 on Stuyvesant Avenue in Lyndhurst, NJ. 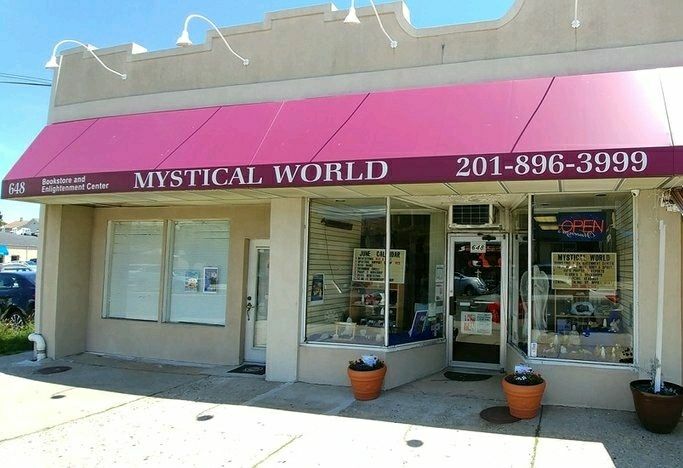 It was a small store and we didn’t have a large inventory of merchandise, but we did offer readings and meditation classes as well as a few workshops. The parking was terrible so after about 4 years we decided to move to a different location. That location was the building that we are currently in; however, our store was located on the opposite side of the restaurant next door. It was larger than our original location so we were able to offer more workshops and meditation classes. We were also able to increase our inventory and made it as diverse as we could so that we could better serve our customers. About a year later we decided to hold our first Psychic Fair. We only had 4 Readers and we set them up at tables in the backyard. (There really was a back yard at the time, now it’s a parking lot.) We had refreshments in the back room and kept the door open so folks could access the backyard. A squirrel decided to come into the back room and quickly left when one of our customers screamed in surprise. I guess we’ll never know if the squirrel was looking for a reading or a snack! After a few years we outgrew the space and the opportunity came for us to move to the opposite side and expand into the Enlightenment Center we are today. We now offer more workshops and meditation classes as well as Special Events. We still host our Quarterly Psychic Fairs which are held indoors as well as a Mini Halloween Fair. We currently have 7 Readers at every event (5 on Halloween) and we still provide refreshments. (The squirrel never came back). Our Mission was, and continues to be, to help individuals increase their power of positive thinking and find their higher selves through books, workshops and meditation in a peaceful, supportive environment. Sara is the owner / Founder of Mystical World. She holds a Bachelor of Metaphysical Science degree and is an ordained Metaphysical Minister and an associate member of the International Metaphysical Ministry. She is also a Certified Hypnocounselor and Past Life Specialist, and has been a spiritual healer and counselor for over 25 years. Yvette is the Store Manager and Center Coordinator. She holds a Bachelor of Metaphysical Science degree and is an ordained Metaphysical Minister and an associate member of the International Metaphysical Ministry, as well as a Licensed Spiritual Healer, Certified Vibrational Sound Master Teacher and Shamanist.